The Remington T-Studio Pearl Ceramic Professional Styling Wand is the best curling iron I have ever used. I have always had trouble curling my hair and this wand works magic! I have the 1″ to 1 1/2″ curling wand and it can create tight or loose curls. I find I only need to hold the curl on the wand for about 10 seconds. The wand always creates a beautiful, shiny curl. The curls hold all day and even into the next day. I still cannot believe the results I get from using this curling wand. I have never been able to get my hair to curl and this wand does it with almost no effort. And to make it even better, the next day I always wake up with beautiful beachy waves. I tried using the Remington T-Studio Styling Wand without any hair products and my curl held all day and my hair was still curled when I woke up the next day. The wand has swivel cord that is almost 6 feet long. It also has a small plastic stand attached to it so it can easily sit on your counter while warming up. The curling wand comes with a glove to prevent you from burning your fingers but I don’t find myself using the glove as I find it makes things more difficult. The glove is small in size and actually fits my hand, some other curling wands I have tried came with a huge glove that only got in my way. 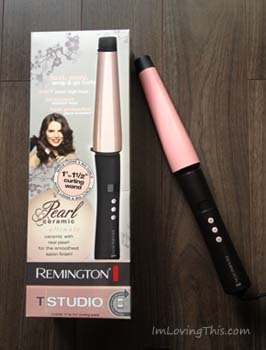 The Remington T-Studio Pearl Ceramic Professional Styling Wand is very inexpensive. It can run anywhere from $24.99 to $29.99 depending on which size you purchase. I have even seen it on sale for about $20.00. The Remington T-Studio Pearl Ceramic Professional Styling Wand is hands down the best curling iron/wand I have ever used. I highly recommend that you try it if you are on the market for a new one. I am going to buy the smaller wand soon as well because I am so impressed with it.